Be Relaxed ~ Senior pictures are fun. We have found that if you schedule your sitting with a classmate or close friend, you will feel more comfortable, plus, there is the added benefit of having a fun session with your friend. Clothing ~ The outfits you select are a big part of the success of your photos. Make sure you are comfortable with your choices. Vivid colors photograph well. Remember, even though these are your pictures, bring at least one outfit that mom likes. Makeup ~ Makeup can greatly enhance your photographs. You may want to consult a makeover artist for some tips prior to your sitting. BOYS, if you have trouble with blemishes, applying a small amount of cover up will greatly improve your photos. 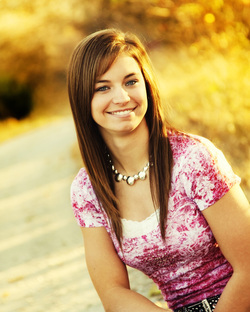 For exceptional senior pictures, please don't ignore this very important step! Props~ Bringing items that are important to you can make your portraits very unique. Cars, trucks, motorcycles, musical instruments, pets, hats, sunglasses, sports equipment, T-shirt collections, athletic and musical and cheer leading uniforms, posters of favorite musical and sports figures, etc. Anything that portrays the real you can enhance your photos. Glasses ~ Glass glare can be a serious problem. Please borrow some empty frames from your doctor.